Concise policy briefs that provide timely responses to developing crises or contributions to current policy dilemmas. The oceans have long been a critical arena for international relations. Before there was air travel and instantaneous communication, people, goods, and ideas traveled the world by ship. For centuries a strong maritime presence—both military and commercial—has been essential for states with great power aspirations. Today, even with advances in technology, seaborne commerce remains the linchpin of the global economy. As the International Maritime Organization reports, “more than 90 percent of global trade is carried by sea.” And beyond trade, a host of other issues, ranging from climate change and energy to defense and piracy, ensure that the oceans will hold considerable strategic interest well into the future. In this Council Special Report, Scott G. Borgerson explores an important element of the maritime policy regime: the United Nations Convention on the Law of the Sea. He examines the international negotiations that led to the convention, as well as the history of debates in the United States over whether to join it. He then analyzes the strategic importance of the oceans for U.S. foreign policy today. The report ultimately makes a strong case for the United States to accede to the Convention on the Law of the Sea, contending that doing so would benefit U.S. national security as well as America’s economic and environmental interests. Among other things, the report argues, accession to the convention would secure rights for U.S. commercial and naval ships, boost the competitiveness of American firms in activities at sea, and increase U.S. influence in important policy decisions, such as adjudications of national claims to potentially resource-rich sections of the continental shelf. A quarterly newsletter featuring the latest on multilateral cooperation in the twenty-first century, from the International Institutions and Global Governance program. The National Interest and the Law of the Sea offers a combination of historical, legal, and strategic analysis. It illustrates how much of what the United States seeks to do in the world—be it deploying military forces abroad or ensuring adequate supplies of energy—depends in large measure on the sea. The result is an important contribution on a set of issues that has been central to national power and foreign policy for centuries. 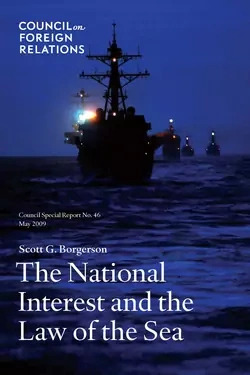 Scott Borgerson’s CFR report The National Interest and the Law of the Sea succinctly outlines the costs of remaining outside and the benefits of joining the 1982 UN Convention on the Law of the Sea. This report should be the first reading for those seeking to understand the arguments surrounding the treaty and how finally acceding to the convention is in our national security, economic, and environmental interests. Washington will need to identify and commit to specific goals in the Indo-Pacific if this geographic and strategic approach is to be successful. As national governments, international institutions, and nonstate actors explore different approaches to Arctic governance, a cohesive approach is necessary to address the environmental, economic, sociocultural, and geopolitical challenges this region faces. With much of the world’s attention fixated on climate change, the Our Ocean conference is a great opportunity to address the health of the oceans and garner commitments to save it from the scourges of pollution, overfishing, and transnational crime. A high level of coordination suggests the perpetrators had substantial expertise, possibly drawn from a foreign-based terrorist group. A Global Pact for the Environment would lend coherence to international environmental law, give greater legal and political heft to existing environmental covenants, and safeguard the imperiled biosphere. Iran appears increasingly boxed in by intensifying U.S. sanctions, the latest of which will effectively cut it off from its main oil customers.